In my experience, role definition and change management are the most difficult obstacles to overcome for large organizations that adopt Agile. Employees going through a transition naturally feel threatened and pushed out of their comfort zone by the barrage of changes—from the process they use, to the changes in titles, the reporting structure, and the focus on results versus risk mitigation. Resentment and resistance to the aforementioned changes may create a toxic environment if leadership does not take preemptive steps to communicate, set expectations, and position team members to succeed. The most tangible impact can be felt for roles in project management, product management, and business analysis, as they are exposed to the agile counterparts that often have overlapping responsibilities and skillsets (think product owners, product managers, Scrum masters, team leads, etc.). In other words, a classical product manager within a small business lending division is a different role from a digital product owner. Seniority, authority, and reporting structures get challenged if roles are not clearly defined, communicated, and accepted by all involved. Another challenge that warrants a separate article altogether is the change in the reporting structure typically found at an organization that has not yet adopted a product orientation. In financial services, one can frequently find two organizations, business and IT, for each division (e.g., retail banking). 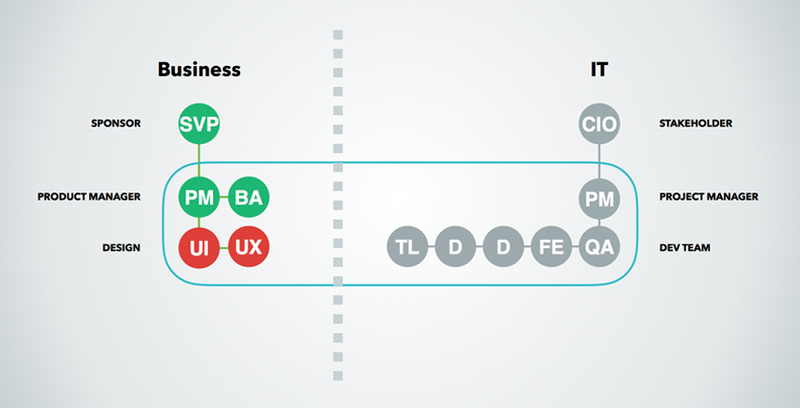 IT manages delivery and is funded by the business, but product requirements and definition is owned by the business. When a product is built by the team, ownership is shared across two chains of command—without a single decision-maker. In other words, IT is responsible for delivery, but business can override scope, often getting IT into trouble—missing deadlines, and so forth. I urge everyone to consider removing the nomenclature of “project” from their vocabulary when talking about digital experiences. These are not projects, they are digital products. They don’t start and end, they exist in perpetuity as your customers discover, experience, attach themselves, and promote your brand through said products. This paradigm shift warrants a new structure. Many progressive organizations today are experimenting by creating a digital group within the business where the whole organization is aligned around product with shared goals. This is the ideal approach, allowing teams to work in truly collaborative nature with the ultimate objective of getting the product customers want out the door as quickly as possible. 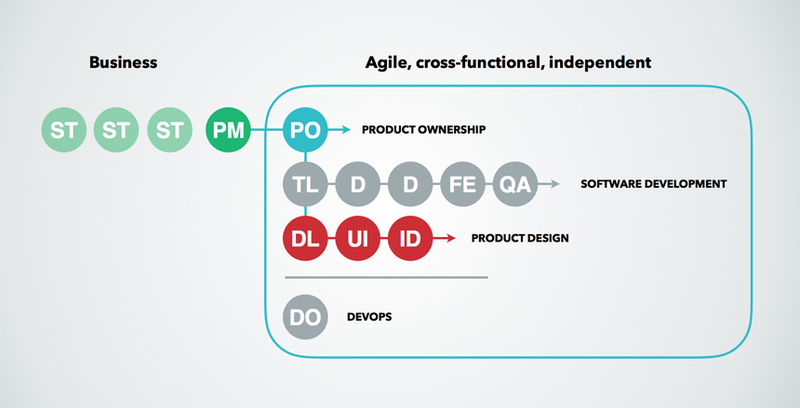 In these instances, the product owner (and product manager) have the decision-making power to adjust scope, reprioritize, and take product to market—essentially, they are an empowered unit with full ownership. This is fundamentally different from classic project management, where authority trickles down instead of residing at the operating team level. Oversees the product management discipline for a given business line (e.g., commercial lending). Develops practice leadership. Manages a portfolio of digital products and associated product managers. Works with C-level executives to understand and communicate investment themes, strategic business direction, and distribute funding across products in their portfolio. Owns the customer relationship and strategic direction for a given product(s). Owns product charter, monitors product KPIs, represents the customers, marketing of product, etc. Works with product managers, stakeholders, and users to capture requirements, write backlog, define acceptance criteria, communicate with team, clear roadblocks, participate in ceremonies, facilitate product demos, and make product-level priority decisions. An area I would pay special attention to is the ownership of priorities for a product. This responsibility belongs first to the product owner, however the whole product organization should be in agreement to afford scalability. In other words, the portfolio managers prioritize investment themes, product managers prioritize epics, and product owners prioritize stories. A challenge that organizations often run into is trying to reassign project managers and analysts to be product owners without consideration for level of seniority, maturity, and competence necessary to truly represent the product. More on that later. You have a proven track record of delivering complex digital products at scale in challenging environments. You've mastered the tools, technology, and techniques used to take products to market quickly. You understand what it takes to operate agile software development at scale, and know how to translate ambiguous vision into detailed, technically sound backlog. You understand how to build strong relationships and manage stakeholder expectations effectively. You know how to grow strategic relationships through successful delivery and new opportunity exploration. You've coached and trained product managers on agile best practices and understand how to mentor and grow those around you. You have a growth mindset, strong emotional intelligence, and reputation for delivering results. Delivering results: You understand what is expected of you and require little direction or support to get things done. You understand how to make an impact. You know how to deliver complex projects at scale in challenging environments with difficult stakeholders. You prioritize your workload and tasks effectively, produce high-quality results in a timely manner and do what you say you'll do. You use your time, energy, and resources efficiently. You manage and delegate work effectively, and know when to ask for help. You have an economic mindset. Emotional intelligence: You understand how to identify and manage your emotions and the emotions of those around you. You have empathy for others and can consider multiple points of view. You demonstrate strong social maturity by thinking, speaking, and acting professionally and with integrity. You have confidence in your abilities and humility in your approach. You understand how to handle stressful situations and manage your own stress well. You have a can-do attitude and a positive approach to getting things done. Communication skills: You are concise and articulate. You tailor your communication style to your audience, understand how to translate technical information to non-technical audiences, and know how to facilitate and lead large groups. You understand how to influence others and navigate difficult conversations. You know how to steer communication in the right direction to get the outcomes you want. You are responsive to your stakeholders and colleagues and manage expectations effectively. Coaching: You value the growth of others. You identify their strengths and weakness and tailor your approach to educate them. You understand how to get the best out of yourself and others. You provide constructive and specific feedback to your peers. You are coachable, listen well, respond to feedback positively, and use it to better yourself. You demonstrate leadership by example and inspire others. Practice leadership: You reject mediocrity and seek mastery in your craft. You stay up to date on industry best practice with the tools and techniques you use every day. You continually look for ways to improve the processes and practices around you and embrace an experimentation mindset to identify new approaches. You are an active member of the practice community, actively contribute to the industry, and are seen as a thought leader. Growth mindset: You enjoy new and difficult challenges. You have a constant need to improve yourself. You are deeply passionate about seeking knowledge and are constantly learning. You know that you can improve your abilities through hard work and dedication. You understand how to identify gaps in your abilities, embrace feedback, and take steps to improve yourself. You find lessons and inspiration in the success of others around you. You persist in the face of setbacks and learn quickly from your mistakes. The above skill maturity will vary based on seniority of the product managers and product owners in your organization. Junior people will largely be focused on capable delivery, more senior people on improving delivery of others and coaching strategies to the larger team.